If I were to hand you a cake and suggest you take some, you would likely take a knife, and make two cuts to define a wedge of the cake, which you could then easily remove with your fingers, and easily eat. Figure 1. 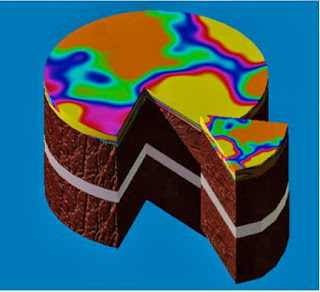 Conventional cutting of a piece of cake. However if one takes the approach used in many machine shops, and in many of the processes that are used to excavate soil and rock, then the process and product are a lot different. For, instead of just making two cuts that make it easy to remove and handle the product, instead the operator takes the knife and chops up the piece of cake into small particles. Figure 2. Milling pockets into a piece of cake, with a pile of crumbs. Now while it is true that this might produce nice clean pockets in the cake, it does leave the extracted cake in small pieces that cost a lot more energy to produce, are a lot more difficult to collect and handle, and are relatively worthless without being reprocessed back into a more useful form. 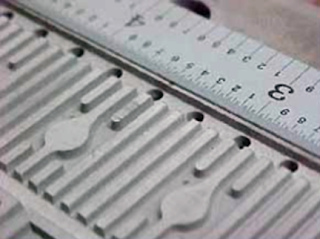 In some cases, where the cuts are made to the edge of the piece, it is not that difficult to adapt waterjet technology to emulate the knife in the above example. Cuts can be made along the edges of the pocket in such a way that they intersect within the piece to define a block of material that can be removed. Figure 3. Piece of metal trimmed from a block in a form that allows it to be used for something else. 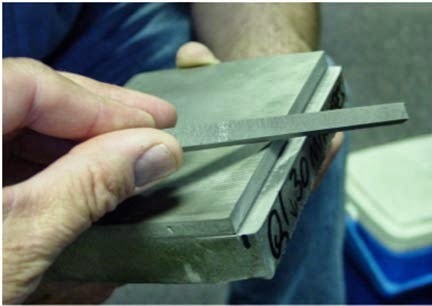 Or one could merely cut around the desired shape in the block, using a high-pressure abrasive waterjet, which would produce the central block as a single piece that could then be used as feed stock for another part. Figure 5. 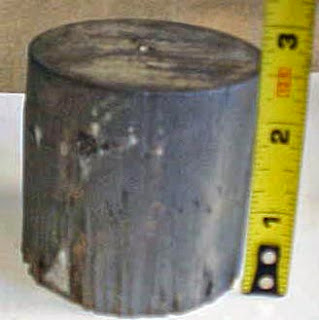 Removed block of material from the piece shown in Figure 4. (For this initial demonstration the quality of the side cut was not considered important, it can be significantly improved for both internal and external surfaces, as discussed below). Life becomes a little more complicated when the pocket must be generated without through cutting the part, and where the depths of the individual cuts must be precise, at the same time as the wall quality must my produced to final surface specifications. There are a number of techniques that can be used in this case, depending on the material being cut, and on the depth that the pocket must be cut to. As mentioned in a previous piece, when higher quality surfaces are required then the cut must be made only with particles that have not cut, bounced and recut the work piece. Rather they must leave the cutting zone after the first cut, without further damage. When the abrasive cutting conditions are controlled accurately, then the precision control in the depth of cut can be high, so that, for example, channels can be precisely cut into engine parts as needed. In the above case the channels were narrow enough to be removed by the full width of the cutting jet, however, when larger pockets must be cut then this precision must be maintained over the full depth. A problem that can then arise comes from the shape of the cut as it gets deeper. If the nozzle is not advanced into the cut (and this is not normally possible given the relative widths of the two) then there will normally be a slight taper into the cut as it deepens. With relatively thin work structure this taper will often be slight enough that it does not fall outside the tolerance required for the cut. Quality control can be achieved, therefore, with a series of rapidly moving nozzle, shallow individual cut passes. Omertz, for example, showed that a much better control of cut depth and wall quality can be achieved by twelve passes at a higher rate than a single pass over the surface with the same residence time on the part. However the optimal condition will depend on the tolerance on asperities in the floor, and the total depth of cut to be achieved, as well as the material being cut. In deeper parts the sides of the wall can narrow to interfere with the jet structure and create ripples that take the deeper wall surfaces beyond this acceptable limit. Figure 7. 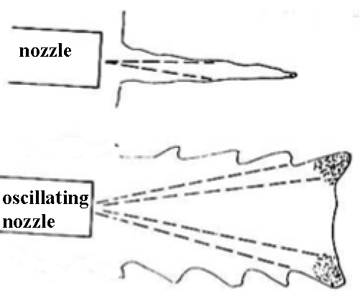 Schematic of the jet structure as it moves away from the nozzle. 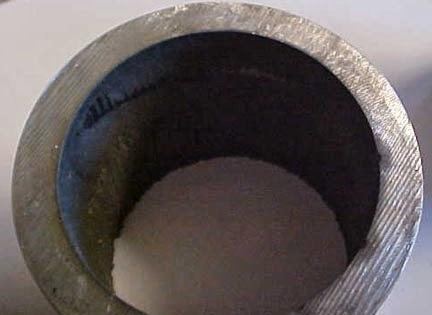 One solution to this is to return to the technology that we demonstrated with John Shepherd’s Wobbler namely to move the nozzle in such a way that the jet oscillates over the surface, not only making multiple passes along the floor of the desired cut at a high enough speed to achieve good depth control, but also by slightly widening the cut there is less chance of undesirable bounces from particles on the edge of the jet from causing out-of-tolerance rippling in the lower parts of the cut. Figure 8. 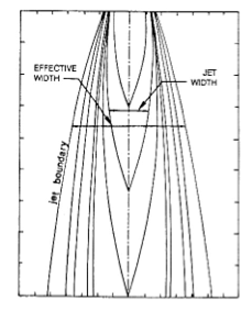 Exaggerated movement schematic to show how oscillating the head widens the cut, allowing the jet better access to the bottom of the cut without sidewall interference. This particular aspect of nozzle motion has also been studied in Australia and Italy. The Australian results, for example, (Patel, Chen and Siores, 6th Pacific Rim Conference, Brisbane, 2000) looked at oscillation both along the cut and transverse to it. 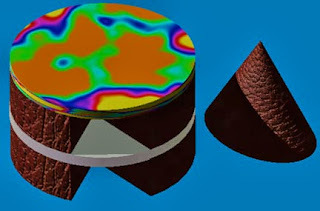 They found that surface quality was improved three-fold on the walls of the cut, and that, depending on oscillation angle and frequency, the smooth zone cut depth could be extended further into the work piece. 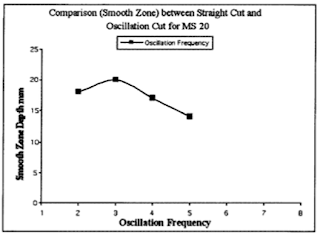 The optimal angle of oscillation was found to be three degrees. How one breaks out the floor of the pocket, after defining the walls remains a work in progress. If you are looking to BUY bitcoins online, Paxful is the #1 source for bitcoins as it allows buying bitcoins by 100's of payment methods, such as MoneyGram, Western Union, PayPal, Credit Card and they even allow exchanging your gift cards for bitcoins. Have you ever consider automating your free bitcoin claims with a BTC FAUCET ROTATOR?